I had previously reported on Mayor Kwame M. Kilpatrick and the War on Illegal Dumping. One of the areas that he had been unable to make progress on was a proposed amendment to the City Code, which would put an end to tenants having their stuff put on the curb during an eviction. Under the Mayor's plan, landlords are to provide a roll-off container for any possessions that a tenant may have and to have said containers removed within 48 hours of an eviction. As of my report on how things stood 3 months into the Mayor's War on Illegal Dumping, that proposed change was still pending before the Detroit City Council. Kenneth V. Cockrel, Jr. , President of the Detroit City Council, had originally indicated that it wouldn't likely come to a vote until October. 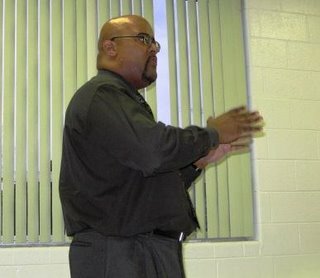 However, when President Cockrel made a visit to the Warrendale Community Organization for their September general membership meeting, members of the W.C.O. expressed their concern about the delays. One week later - the change has happened. As of last week, landlords are now required to provide a roll-off container whenever one of their residents are evicted. Those containers must also be removed within 48 hours of the eviction. And folks wonder why I say coming to a W.C.O. meeting is so important? Anyway, the next W.C.O. meeting will be on Monday, October 2 at 7 p.m. in the Activities Building of Sts. Peter & Paul Church. You need to update the site. COuncil pased this ordinance. Yeah, I know. That was the point of the post. Hence the sentence, "One week later - the change has happened."